November is Family Literacy Month, a 30-day opportunity to educate parents about the importance of reading at home. In 2018, illiteracy is such a serious problem in our country that 44 million adults are unable to read a simple story to their children. Over 60 percent of kids in low-income areas are growing up without any children’s books in their homes. Yet 79 percent of educators believe family engagement in literacy education is essential. Schools across the country are implementing family literacy nights, book breakfasts, and reading events to bridge the gap between home and school to increase academic success. Parents are our students’ very first teachers, and it is the job of educators to empower parents to help their children become successful, independent readers. One nonprofit organization that can help is Read to Them, which is creating a culture of literacy in homes in all 50 states. The organization developed the “One School, One Book” model that engages elementary school communities in reading and talking about a single popular chapter book for a three- to four-week period. Many schools do a kickoff assembly and host a culminating activity. When I was working as an elementary school reading specialist in Virginia, I chose Charlie and the Chocolate Factory by Roald Dahl as our winter title. To bring the book to life, we invited a chocolatier to be a guest speaker for the students and implemented an entrepreneurship unit to create a new candy. Our culminating activity was a dual movie screening in the gym and cafeteria, both with candy-themed decorations, for families to spend time together and compare the book to the original film. But it’s not only schools that are on board; districts and even entire states are signing up to engage families in reading in communities coast to coast. And while this month focuses on family literacy, parents can involve their children in effective reading activities every day of the year to equip them with the tools for literacy success. Children mimic what they see; when children see their parents reading, they will start reading too. Scheduling regular visits to a bookstore or library shows that reading is a priority at home. Taking children to get their own library card provides ownership of their reading path. Carving out 20 minutes a day to read to children, listen to them read to you, or read together with them increases vocabulary and literacy engagement. Early literacy skills are necessary to help children achieve success. These include reading, talking, and singing to children from the day they are born. Exploring rhyme, letter names, and letter sounds from an early age through conversation and books sets the stage for success in school and is essential in helping children see the strong connection between reading and writing. Later on, helping children write about what they are reading and read their own writing with attention to word family patterns supports growth in literacy. For elementary-school-age children, it’s essential to match a high-interest book not only to a child but also to the child’s reading level. A common myth is that giving a harder book to a child will help him or her become a better reader. Quite the opposite happens — children often become frustrated when they can’t decode the words on a page, which can deter them from reading altogether. Giving children texts at their instructional level raises both their confidence and their reading levels. For all ages, in addition to reading, it’s important to talk about text, which increases understanding. Comprehension is the ultimate goal of reading, and asking questions before, during, and after reading helps to achieve this goal. Ask the “5 Ws and H” — Who? What? When? Where? Why? How? — about facts or details from a story. Motivation and engagement are two key factors in increasing literacy rates and reading fluency. 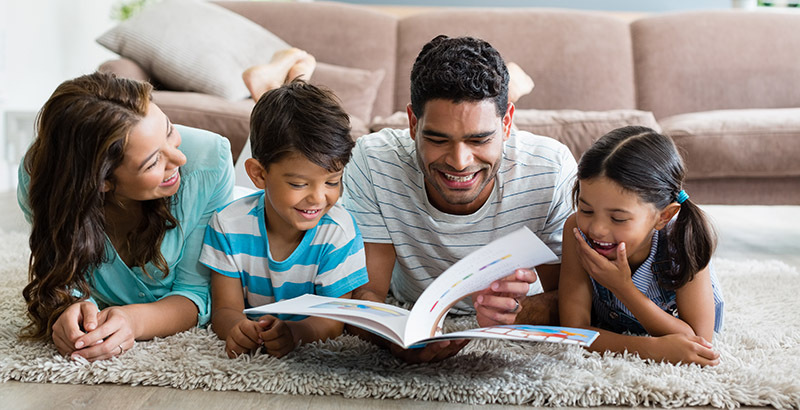 Family engagement embodies both components and is one of the most significant building blocks to ensure all children become successful readers and lifelong learners. Kathryn Starke is an urban literacy specialist, reading consultant, author, and founder of Creative Minds Publications, a global literacy-based educational company. She is publisher of Tackle Reading, a resource that motivates children, supports parents, and inspires educators to love literacy with stories written by NFL players, celebrities, and authors who are passionate about reading education.